Most women love their children desperately and want to be good mothers. Unfortunately that leaves them vulnerable to experts, real and self-proclaimed, who insist they know what is “best” for babies. But what women (and experts) often fail to realize is that what is best is often determined by socio-cultural factors that are left unexamined. For example, parenting experts of the early 20th Century, embedded in a culture that highly valued both technology and conformity, thought that what was “best” for babies was formula, rigid schedules and limited displays of affection so as to prevent becoming spoiled. In contrast, most experts of the early 21st Century, embedded in a culture that highly values nature, experience and maternal self-sacrifice, claim that what is best for both babies and mothers is natural childbirth, breastfeeding and attachment parenting. Good mothers don’t trust parenting experts; they trust themselves. It seems never to occur to experts that mothers themselves might actually know best. After all, mothers (and fathers) love their children more than anyone else, are more attuned to their needs and cues, are responsible for balancing the needs of multiple children within a family, and are best acquainted with the personal, cultural and religious needs of the family as a whole. Simply put, good mothers know what is right for them and their children. And good mothers know that expert advice is often flat out wrong. Keep in mind that I’m not talking about scientific evidence. Doctors and scientists are experts in what the science shows. I’m referring to advice about what constitutes good parenting for a specific mother and child pair. Experts may insist that unmedicated vaginal birth is best because it’s it natural. But good mothers know that their own needs in childbirth are also important. Good mothers often consider the health of the baby paramount, but recognize that their own needs in childbirth (safety, pain relief, and preserving future continence and sexual function) matter a great deal. It is not selfish to consider them; indeed ignoring them is paramount to erasing women from childbirth. Experts claim that breast is best, but good mothers know that ensuring babies are fully fed, content and growing matter far more. The benefits of breastfeeding in industrialized countries are trivial and there are real risks to underfeeding babies. That doesn’t even take into account the suffering of a baby who isn’t getting enough food because his mother isn’t producing enough or because he isn’t able to remove it from the breast. 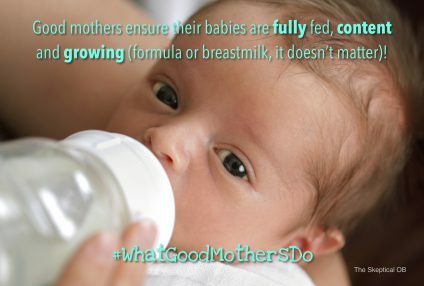 Good mothers know that being fed is far, far more important than being breastfed. Attachment parenting experts claim (with no evidence) that babies have a need for perpetual maternal proximity that exceeds any need a mother has for sleep. They recommend that babies sleep in bed with mothers because it’s natural, because it facilitates breastfeeding (natural!) and promotes infant security and self-confidence (they just made that up). In contrast, good mothers know that their own needs for sleep, privacy and partner intimacy are also critically important. Indeed, sleep deprivation can contribute to maternal postpartum depression, a condition that is bad for both babies and mothers. Moreover, good mothers know that bed sharing is a safety issue because it increases the risk of sudden infant death syndrome. You may have noticed a theme. 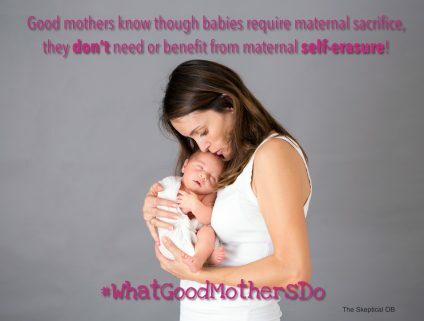 Good mothers know that though babies require maternal sacrifice, they don’t need and don’t benefit from maternal self-erasure. We should be looking carefully at the socio-cultural factors that have led to a philosophy of mothering that demands total self-abnegation. While experts may claim that such a philosophy is best for babies or that it must be correct because it is natural, the truth is as old as recorded history if not older. It’s about controlling women through the love they have for their children. Contemporary parenting philosophy is based on prejudices about women, where they belong and what they can be allowed to do. Specifically, contemporary parenting philosophy is built on the belief that women belong at home, with no personal identity or needs, and that anything they do for themselves — whether as mundane as getting adequate sleep or as phenomenal as winning a Nobel prize — necessarily comes at the expense of their primary purpose: bearing and raising children. But good mothers know that maternal needs and children’s needs dovetail most of the time. Children don’t need a mother who is a doormat; they only need a mother who loves them. And good mothers know that love has nothing to do with childbirth, breastfeeding or attachment parenting. Countries with the highest breastfeeding rates have the highest infant mortality; countries with the lowest infant mortality have the lowest breastfeeding rates. There’s no evidence that increasing breastfeeding rates have had ANY impact on the health of term babies (breastmilk is beneficial for preemies because it prevents necrotizing enterocolitis). I recommend Joan Wolf’s book “Is Breast Best”. She also has a published paper with the same or similar title that you can find on Medline or EBSCO host that is peer reviewed. 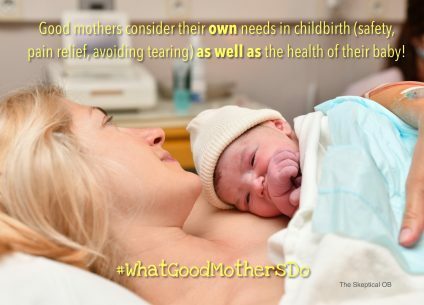 The one thing I’ll add is that the answer of “what good mothers do” will change depending on the particular mother, and even the particular baby. With Girl 1, extended breastfeeding and co-sleeping ended up being the right thing to do – because it was the only thing that worked for us. I never intended to do either, but had a sensitive baby with reflux who hated formula, screamed the instant she got hungry and wouldn’t sleep alone in her crib. Our one and only attempt at sleep training ended when she cried until she puked. Otherwise, trying to get her to sleep involved pacing the hallways of our building between 1 a.m. and 5 a.m. while bouncing her, every single night, while slowly going insane from exhaustion. Getting rid of pillows and fluffy bedding and co-sleeping following safe guidelines, breastfeeding as needed, was a FAR easier solution that allowed both of us to thrive. Co-sleeping wasn’t as safe a solution with Girl 2, who was more adventurous and less aware of gravity, and therefore liable to crawl right off the bed. The Boy, OTOH, really just wanted to sleep. A lot. In the dark, alone, in his own crib. Co-sleeping just annoyed and distracted him. His “sleep training” consisted of putting him in a crib when he first showed signs of being sleepy and waiting 5 minutes. Girl 1 still has a sensitive gut and palette, and still wants to connect multiple times per day. The Boy still needs his sleep and will fall asleep almost anywhere. They are 19 and 14. These are beautiful. I really appreciate having some positive message image macros to share on social media. I know what you are trying to get at, but please remember that this message can be really damaging to mothers of babies with colic. A colicky baby that is well cared for, surrounded by love and skilled care providers will still fuss and complain – and has a safe and nurturing space in which to fuss and complain and get out all of his frustrations about whatever is going on in his belly. A toddler will still have growing pains and get overtired every once in awhile from just the daily business of growing and learning and playing, and will throw a tantrum. Those kids still know that being close to mom (or dad) is the safest and best place in the world. Attachment parenting works well for some families, and indeed, my eldest was quite keen on it for his first year or so. Now, however, both are far too independent to put up with it much. My daughter preferred to sleep -near- us rather than in any one’s arms from the start. Took us about 2 weeks to figure this out. Mind, I still can’t use the toilet without company. snort. I was told all about attachment parenting and the need to hold baby a lot and bond, but my son was fussy and in fact wouldn’t sleep at all until put down in a crib and left entirely alone. He almost never fell asleep in my arms! All of my kids were different. My oldest was a pretty typical, but very easy baby. My youngest was velcro baby. My middle didn’t want to be held if he could avoid it. He barely tolerated being held to eat, and the rest of the time he just wanted to be on his own. I think we conditioned our firstborn to fall asleep while being worn/carried and it took some time to break the association. In hindsight we should have just put her down drowsy and let her fuss a bit. She probably would have learned to fall asleep on her own. By the time we got to kid #3 I’d deconverted from the woo and put him down drowsy from the get-go, and he slept pretty well and we never had to do much in the way of sleep training or anything. I quite enjoy having someone to chat to while I’m having a dump. In my kids’ early years I did fall for some of the mommy martyr stuff. There were many years when I went well beyond what was emotionally healthy for me. At some point I said “enough”, and started prioritizing my needs. Not terribly long ago (a few months or so), I was chatting with my older two about the related issues of their friends leaning on them for help and support and how sometimes they weren’t in a place where they could offer that support without emotional damage to themselves. We talked about how to draw boundaries while still being a caring a supportive friend. That morphed into a walk down memory lane, and the time period when I started putting my emotional needs first at least some of the times. Both of my older boys agreed that I became a far better, and happier, parent after I made sure to take care of myself as well as them. It’s amazing how much more you can get done when you’re in a mentally healthy place yourself. BeatriceC, from some of your other posts – I am facing a similar situation as you with two special needs children. Is there a way I could ask questions about how you managed? Sure. I’m not sure if this is the best platform for those questions though. I wish discus gave the ability to private message. I’m fairly easy to identify on FB, though I’m not super active on the Skeptical OB page. Amen to the sleep! I can’t even fathom keeping baby in my room for a whole year, per current recommendations. The minute baby slept through the night and I didn’t (dang babies are noisy sleepers) that child was in her own room – she was 1 month old. My sleep is important too! lol, there are advantages to hearing impairment! I had a twin bed in the nursery, with every intention of sleeping in there because “everyone said” I had to room share. I didn’t even last 2 nights before I went back to my room and got a baby monitor instead. At nearly 8, he’s still a noisy sleeper. My son was only rarely able to sleep deeply on me or my husband during skin-to-skin when he was in the NICU as a micro preemie snippet. After 2-3 hours, I swear he’d get wriggly and try to explain that he really needed to go back in his isolette for a nice nap. Watching him gently rub his face into the mattress before he fell asleep looked cozy. The same pattern followed us home. Spawn’s never been able to sleep on me for long. He’d take one 1 hour nap on my husband when he was a newborn and even as a young infant – but by the time he was 4 months old he was clear that his bassinet was for naps and sleep, thank you very much. And now as a toddler, he’s very clear that he appreciates naps, night sleeping and Spawn-time in his room. It’s adorable that if he’s having a rough time, he’ll either sign “Sleep!” at us or grab his kitty while pointing upstairs to let us know that he needs some quiet time upstairs alone. We view that as only being fair since my husband and I both need introvert time to recharge. I swear some of it is temperature preference too. Some people just need it a little cooler to sleep, and the heat from another body nearby is intolerable (your son). Others need to be ‘warm and cozy’ and feed off of that body heat to drift off (my daughter, who still sleeps with me at 6). Think how long you and spawn’s other parent can comfortably sleep on each other after that activity that created spawn. Not all night! Someone’s arm/leg goes numb. Why should a kid be made to sleep on a parent? LOL I love how all of this screams of upper middle class economics, too. How many single Moms or working class Moms have the time off to even breastfeed, let alone co-sleep [This last is not aimed at you –but at the whole AP culture]. I often think AP is keeping a mother from having to have a job. I find that there are weird double standards when it comes to compliance with safe sleep guidelines. Recently I’ve seen mothers get absolutely slaughtered on other parenting sites for what strike me as relatively minor diversions from recommended practice, e.g. putting a baby to bed in a safe sleep space in the parental bedroom at 7pm with a monitor and regular checks whilst you do some housework or have some much-needed downtime in another room (“Well, if my baby died of SIDS and I hadn’t followed the guidelines to the letter by being in the same room as them at all times, I’d never get over the guilt. But I guess we’re all different” was one particular passive-aggressive sanctimommy response that made me want to punch that poster on her smug nose). Yet heaven forbid that anyone question the prevailing orthodoxy on those same sites that bedsharing with a newborn is blissful and totally safe. I don’t judge any sleep choice made by an exhausted loving parent, but, let’s face it, it’s all bending the absolute best practice guidelines, so why is one seen as good and the other bad? Apart from the fact that having a warm snuggly baby in your bed “feels” nicer (actually, I’d hate it because I’m easily touched out, but most people seem to love it!). On that last point, I speak as someone who is posting at silly o’clock UK time because I can’t get back to sleep due to being squashed in a corner of my own bed by two cats and a preschooler, who have all been scared by the fireworks. Fun times! I’ve noticed the same thing…the stark contrast between “cosleeping is the only option” and “a cold cot with nothing on it” and nothing in between is acceptable. My ten month old was having terrible sleep problems (still waking crying every hour to 90 minutes through the night) and we would get up to comfort her and rock her back to sleep, but it was hardly working. Baby was miserable, we were miserable. Her pediatrician recommended that we put her on a strict bedtime schedule and use the CIO method. Oh, and to give her a small stuffed toy for comfort. I balked at first, but it worked like charm. After three mildly fussy days, she was no longer crying. We’d kiss her goodnight, she would babble happily to herself for a few minutes, hug her stuffed animal, then roll over and go to sleep. Then she would sleep for a solid 7-8 hours straight. Baby is much happier, and we are much happier. Apparently, all she really needed was some space, some quiet, and a chance to practice self-soothing. Anyway, the point is, when I first brought up my pediatrician’s recommendation on parenting forums, and said that I was considering it, I got called “worse than Hitler”. I know I wasn’t exactly the favorite grandchild, but I’m still pretty sure that my holocaust survivor grandmother would have disagreed. Parenting forums are a trip. Gosh, 56 years ago they hand me to my Mom when I reached 5lbs. I had sleep apnea so she needed to “check” to see if I was breathing “occasionally”. The cat alerted her when I stopped breathing, no joke. I lived. No monitor other than a cat and a 3 1/2 year old brother in the same bedroom. Bed sharing is beyond the call of motherly duty to me. In the parents room for a while–sure. For a YEAR??? Get real. Preach Dr. Amy! I did sleep training for all three of my kids because I need sleep and I laugh when I see what people say about it. People assign thoughts and feelings to babies that I don’t think babies are even capable of having at that developmental stage. For instance, I read once that babies only stop crying when they give up hope that someone will come rescue them. No, they stop when they get tired and go to sleep. You can do whatever you want as a parent, but if you choose to martyr yourself that is on you, not your baby. They are pretty content as long as they are fed, have clean diaper and clothes, and don’t have reflux. After all, I’ve yet to find a psychologically neglected child who was well-fed and allowed to exercise to build their body strength. Instead, people are making connections from orphans or children with disabilities who were dealing with starvation diets, medical neglect, restricted physical movement and no stimulation on top of lack of human contact. Pretending that letting my 4 month old son cry for 7 minutes when he was full, gas-free, clean diaper, cozy clothes, in his bassinet and freaking pissed-off that my husband and I refused to let him stay up with us all night is the same as being an abandoned infant fed one bottle of substandard formula a day is insulting to those abandoned infants. This hit me like a hammer. It’s so true, and it’s so damned pernicious and effective.